Sony Ericsson's no stranger to phones with decent cameras, and the Vivaz with European 3G frequencies aims to be one of them; after all these months we've finally got hold of this S60 device, which is the first phone capable of continuous autofocus on 720p video recording courtesy of its speedy 720MHz Cortex A8 and PowerVR GPU. Compared to its predecessor, the Vivaz bears a similar button layout and GUI to the Satio's, but lacks a front-facing camera, Fast Port (replaced by a micro-USB port and 3.5mm headphone jack), and a slide cover for the camera. 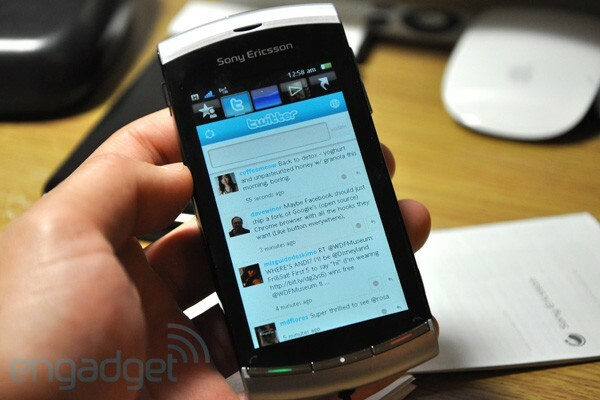 The resistive touchscreen (sigh, more on that later) has been downsized from 3.5 inches to 3.2 inches but retains a similar resolution (640 x 360), while the camera sensor is also scaled down from 12.1 megapixels to a more sensible 8.1, possibly for the sake of picture quality and component cost. But enough with the comparison -- let's get cracking with the review. How would you rate the Vivaz? We have mixed feelings about the Vivaz's appearance -- on one hand the 'human curvature' approach (as applied on the Xperia X10, we've been told) is a fresh change to Sony Ericsson's usual rectangular form factor, but at the same time this does come with a bloated look that some may or may not fancy. The shiny, hollow-sounding plastic chassis is a bit of a downer -- it's the only feature that has turned the Vivaz's lightness (at 3.42 ounces) into a drawback, as the combination inevitably brings the illusion that this £300 / $448 device (as offered by 3 UK) is a budget phone instead. Another niggle is that the back cover's proven to be quite a challenge to rip open, so mind your fingernails. So much for a natural grip, eh? In terms of buttons, the Vivaz has managed to get away with two fewer buttons than the Satio -- the function of the old lock switch is now ported to the power button at the top (tap twice to lock), and while the media playback button on the right side has been killed, the dedicated shutter button now also triggers the still camera function (thus turning the old combo button into a dedicated video recording button). The buttons for volume control (one of which also does search), phone calls and menu are at their original spots. There's hardly anything to fault here as this simpler button layout is pretty easy to pick up, although the lack of lock switch has allowed the phone to unlock itself on several occasions while in our pocket (by pressing the "Unlock" virtual key at the bottom left of the screen). There's no AMOLED magic on the 3.2-inch display, but at 640 x 360, this crisp resolution (229 dpi) will help you check that your lens is in focus while snapping and filming -- not to mention the sharp visual multimedia playback you'll get as well. We did, however, notice that our screen had a slight yellow tint, and we haven't been able to confirm whether this applies to all the Vivaz units. Moving on to a more touchy subject: this phone uses a resistive touchscreen (as the pointy stylus above suggests), but we were almost fooled by its unusual hardness as conventional ones tend to be spongy, so at least it feels good to the touch. We won't go into the whole capacitive versus resistive debate again, but we will say this: resistive is fine only if the user interface is designed in such a way that a stylus is not needed; in other words, the virtual keys need to be finger-friendly, and that pages can be scrolled without the sole reliance on narrow scroll bars. We'll check on this later. Those who are familiar with the Satio should notice this similar camera interface on the Vivaz. You get an identical set of "Scenes" (auto, portrait, landscape, twilight landscape, sports, document, twilight portrait, beach/snow) and "Shoot mode" (normal, panorama, smile detection, touch capture) but without "Bestpic" -- a tool that lets you take a sequence of photos and then pick out the best shot to keep. "Exposure" and "Auto mode" are still there, but the button for disabling the LED flash "Photo light" (same light as the X10's) is now replaced by a "Focus" menu (auto, face detection, macro, landscape); to fiddle with the light, you'll need to go into Settings at the bottom right corner -- probably a pain for more people so we're not sure why Sony Ericsson did this swap. 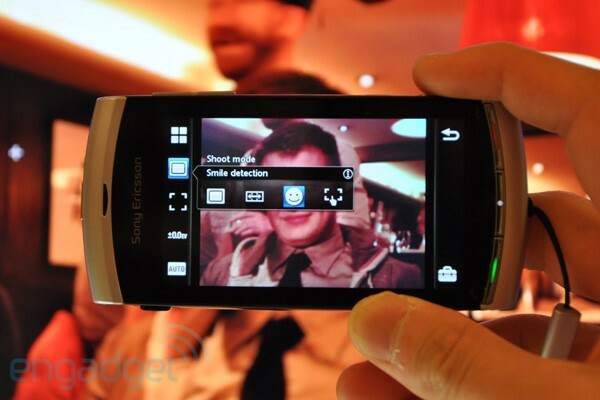 The camera app can be launched by holding down either camera buttons (thus launching the corresponding capture mode), even when the phone's locked. Some may see this as a handy feature for quickly capturing short-lived comical moments, but this also brings the risk of accidentally turning on the camera when it's in your pocket (which has happened to us a few times). Once you're in, you can switch between three aspect ratios (4:3 at 8 megapixels, 3:2 at 7 megapixels, 16:9 at 6 megapixels) and smaller sizes for still shots, whereas in video mode you can choose either 720p or 640 x 480. Picture quality is pretty decent overall -- great colors and sharpness for shots taken in the daylight, albeit with fairly noticeable artifacting in the blue sky; at night, we've had the occasional struggle with the focusing, but the Vivaz's impressive noise reduction is worth the multiple attempts for each shot. Like many compact cameras these days, the Vivaz also offers some fun camera modes as seen on the Satio. We started off with the smile detection mode -- once chosen, you need to press on the shutter button to activate the detection, and it responded best with a bit of teeth. Next up is the panorama mode -- it relies on the accelerometer to guide you through the three-stage shoot, and it worked brilliantly as long as our camera was pointing straight ahead and level for all three shots. Lastly, touch capture was equally impressive and pretty handy for close-up shots. If you don't mind sacrificing a bit more battery juice, you can also enable geotagging for your photos. There aren't as many fancy toys to play with in video capture mode, but the YouTube uploader and the overall video performance alone are enough to keep us satisfied. Again, picture quality is great during both day and night, although the latter does suffer from some color noise. Audio's good, especially with picking up nearby voices even in a noisy environment, but it won't do much good if you're in the wind. Most importantly, the continuous auto-focusing -- a first on a 720p-recording phone -- worked well for us. You can see it all for yourself in the demo video below (and remember to turn on HD playback). Earlier we mentioned how the resistive touchscreen is still acceptable as long as its interface accommodates the finger well, as in avoiding the stylus wherever possible. Sadly, the Vivaz isn't entirely finger-friendly -- the full landscape QWERTY keyboard isn't available in all apps, and some menus are only scrollable using the thin vertical bar on the right. 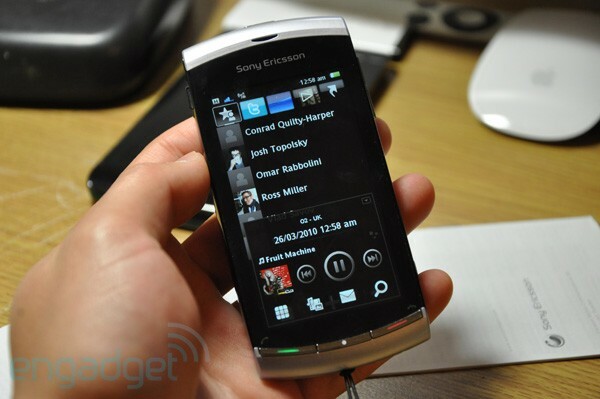 This alone isn't as much of an annoyance as the inconsistency across the menus and apps, so hopefully Sony Ericsson will get this fixed before users go grey. The homescreen consists of five tabbed panels in this default order: favorite contacts, Twitter, "Flow" (some cool accelerometer-based wavy animation that doesn't seem to do much else), camera gallery and shortcuts. You can change the panel type by holding down its tab, thus getting the above list plus two more options: aquarium and album. On each panel you can summon the same shortcut box by clicking on the hang-up button, then you'll have quick access to the dialer, media gallery, messages and search, plus the music playback buttons (accompanied by album artwork) if you have some tunes playing in the background. The Twitter panel is essentially a simple Flash-powered app. How do we know? It says so in the many memory-related error messages we've seen, and the only way to relaunch the crashed app is by restarting the phone. On top of the slightly laggy scrolling, it's also disappointing to see the full QWERTY keyboard missing for Twitter -- we've had to rely on the little stylus to log in (for every boot, that is, as it didn't store our credentials) and compose tweets. The lack of reply and direct message filters is a frustration, too, but you can always hit the Twitter website from the app for your regular Twitter features and the full keyboard. On a more positive note, the minimalistic camera gallery panel is pretty slick -- it's essentially a vertical-scrolling, one-at-a-time photo / video viewer, so from afar the panel appears to be a wallpaper showing the latest picture / video still from the camera. Clicking on the image will launch the full media gallery. We've found a few nice apps preloaded on the Vivaz, namely YouTube, Rally Master (simple accelerometer-based car-racing game), SSX 3 (accelerometer-based snowboarding game), WorldMate (travel planner), GTalk, Google Maps (without multitouch, of course), TrackID (song identifier) and Facebook. You also get a 30-day trial for the Navteq-powered Wisepilot turn-by-turn navigation app, and while we cannot comment on its accuracy since we didn't have a car, we were impressed by the vast amount of POI data that it offered. If you want a different navigation app then you're out of luck, as the PlayNow store doesn't seem to offer any alternatives. Similarly, there are only four free games offered on PlayNow, so you're most likely looking into spending at least £4 / $6.10 per game; you get more free non-game apps, while paid ones start from £2.50 / $3.80 each. Regardless of the prices, looks like PlayNow's got a pretty tall mountain to climb here in comparison to the other platform's app stores in terms of content. There's little to complain about the bog-standard apps such as the media player and organizer. In fact, the delightful music player is pretty much identical to the Satio's -- good to see a familiar feature that works well. The only black sheep here is the web browsing performance and experience -- the phone insists on asking us to pick the connection method (WiFi or 3G) every time we wanted to use Twitter, Facebook or the browser, and then you need to develop the habit of using mobile websites as the browser's crashed on us a few times due to insufficient memory. Neither are acceptable for a smartphone these days, especially the former -- we'd be so much happier if the phone can at least remember or determine our preferred connection method. 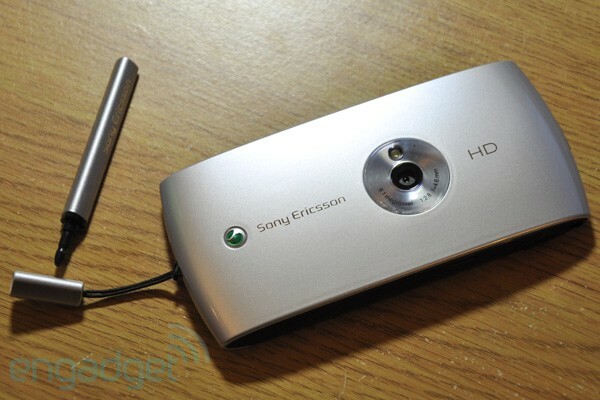 The Vivaz is no doubt a good specimen for showing what Sony Ericsson does best -- great video and photo capture along with a user-friendly media playback interface, not to mention being a world's first with its nice continuous auto-focus 720p video recording. On the other hand, though, the user interface needs some tweaking for the sake of mainly consistency, ease of web access, security (as in so the phone is less likely to unlock itself) and stability (and we hope a software patch will be offered to fix all these). Not much can be done about the phone's build quality now, but we'll let it off this once given the nice curvature for gripping. All in all, we'd say hold off until Sony Ericsson comes up with some software patches -- if they ever get around to it, that is.